Now that you have all your needles and hooks organized, (I don’t know about you, but I discovered a lot of duplicates) you’ve made them easy to find at home when you’re ready to get knitting or crocheting. Now, we’ve all been there. You’re at the yarn store, pattern in hand, wracking your brain trying to remember if you have that G hook at home, or that 32″ US 6 circular. Having everything organized at home is great, but knowing what you already have will save you the trouble of buying duplicates, and will help keep that needle and hook stash down! Personally, I prefer the Ravelry method of tracking my needles and hooks. You can go to your library, and very easily add your needle and hook inventory to the grid. It even has the option to show how many you own of each size. This is so handy when you need two circulars for a project and you can’t remember if you have one or two at home. Then, just print out the card and keep it in your wallet! I put a few strips of clear tape over mine to keep it a little sturdy. When I’m at the yarn shop and buy a needle, I mark it on my card and update my Ravelry when I get a chance. You can even add comments if you want to keep track of the brands you have. Have a smartphone? There are a lot of great apps to help you keep track on the go. I like the Vogue Knitting iPhone App. Not only can you keep track of your needles and hooks, but you can also track the yarn and books you have at home, as well as storing information about all your projects. The Knitting Needles App. 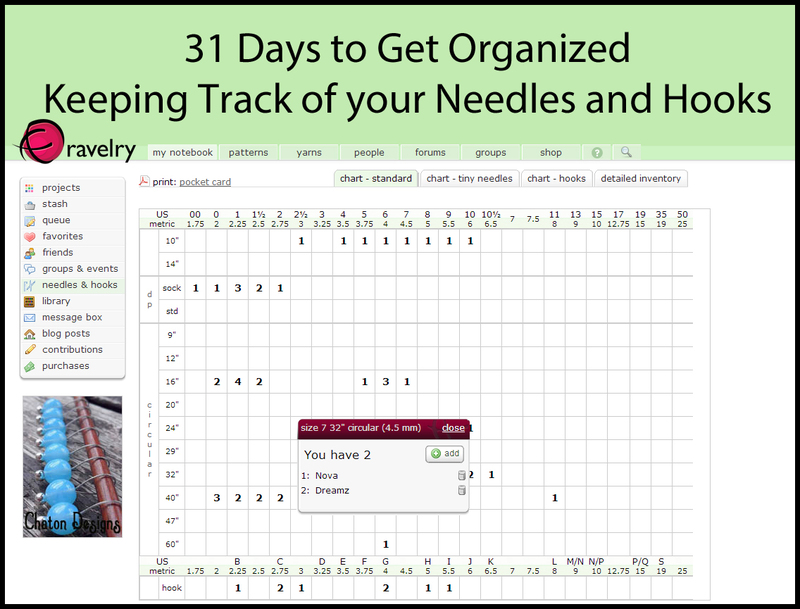 lets you organize your needles in an easy to read chart as well as a list. 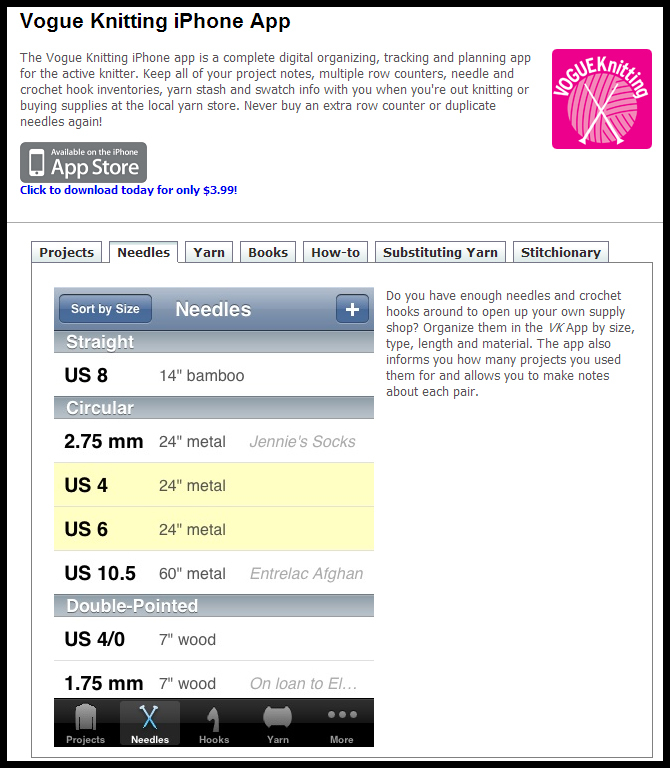 You can also try the Ewe Stash – Knitting and Crochet Inventory App. for comprehensive needle, yarn and project organizing. The Nancy’s Knit Knack Knit-Kards are fantastic. They have handy notes like knitting and crochet terms, as well as charts to keep track of your knitting needles and crochet hooks. How do you keep track of your needles and hooks? Do you keep a chart or your smartphone with you to track while you’re out, or keep an inventory at home? Or maybe you like to live dangerously and rely on memory alone! This entry was posted on Wednesday, January 23rd, 2013 at 11:02 am	and is filed under Tips & Techniques. You can follow any responses to this entry through the RSS 2.0 feed. You can skip to the end and leave a response. Pinging is currently not allowed. I wish there was a good way to use the Ravelry Needle Inventory for Interchangeables. I use a smart phone app, but at this point I really have no need of even buying a needle or questioning if I have the right size. I do wish the apps would add interchangeables so I can track cable lengths and needle sizes. 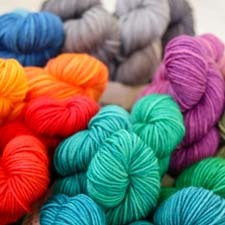 I agree with katiebird… wish there were a way to track needle tips and cables that are part of interchangeable sets!